kat is the bride-turned-wedding-blogging-diva behind the UK based, rock-n-roll bride and she serves up lots of ultra hip eye candy each day on her site! she recently asked to feature 3 of our weddings from last year and here's the links for the triple feature! thanks again kat! we'll have to meet next time we're in london! p.s. our daughter ava (5 years old), LOVES your pink hair! WARNING! some major, but well-deserved bragging is about to take place right here, right now for my brilliant husband! 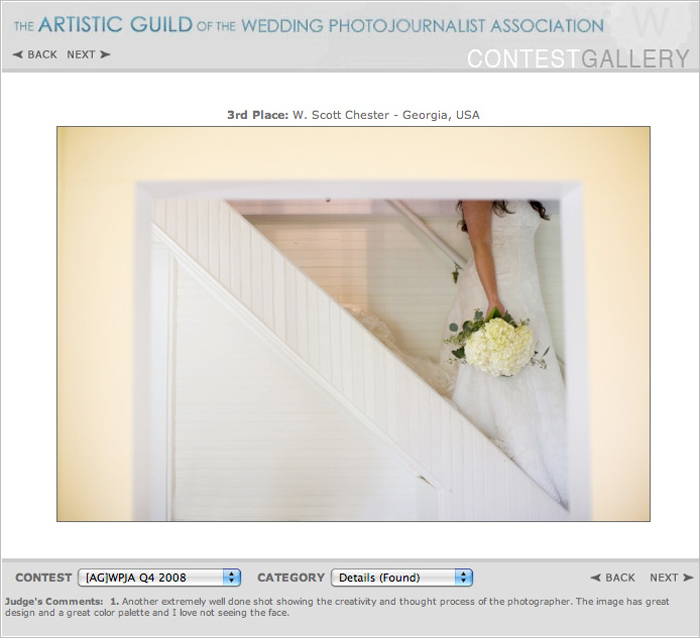 the results for the Q4 2008 international contest of the ARTISTIC GUILD OF THE WEDDING PHOTOJOURNALIST ASSOCIATION [AGWPJA] just came in + scott not only landed a #12 SPOT for this last quarter contest but he scored a #6 SPOT OVERALL FOR THE ENTIRE 2008 YEAR!!! he is alongside some of the most innovative + artistic wedding photographers on this planet! what an incredible honor + we want to thank all of our amazing clients for inspiring his artistic wedding + engagement imagery! 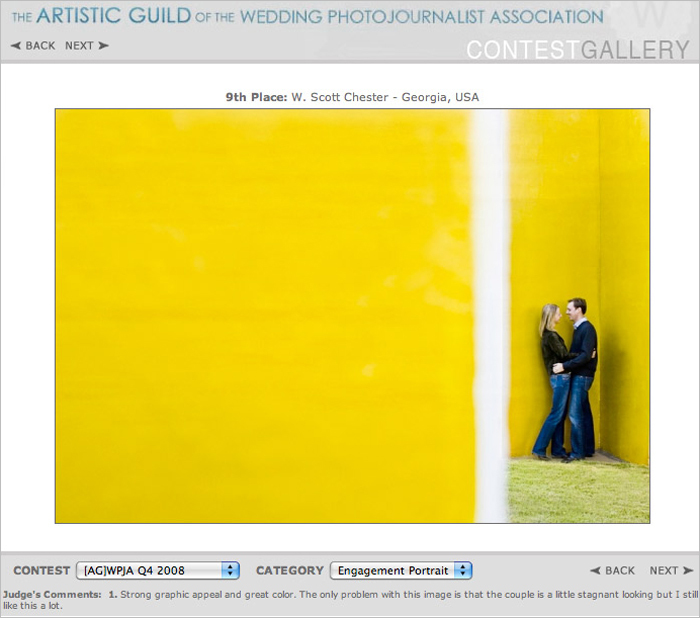 this image is from eryn + craig's wedding + we actually had an image from their wedding place in the Q3 2008 contest, too! this image is from bettina + geoff's e-session! we can't wait for their wedding this september! here's the big brag chart for 2008! 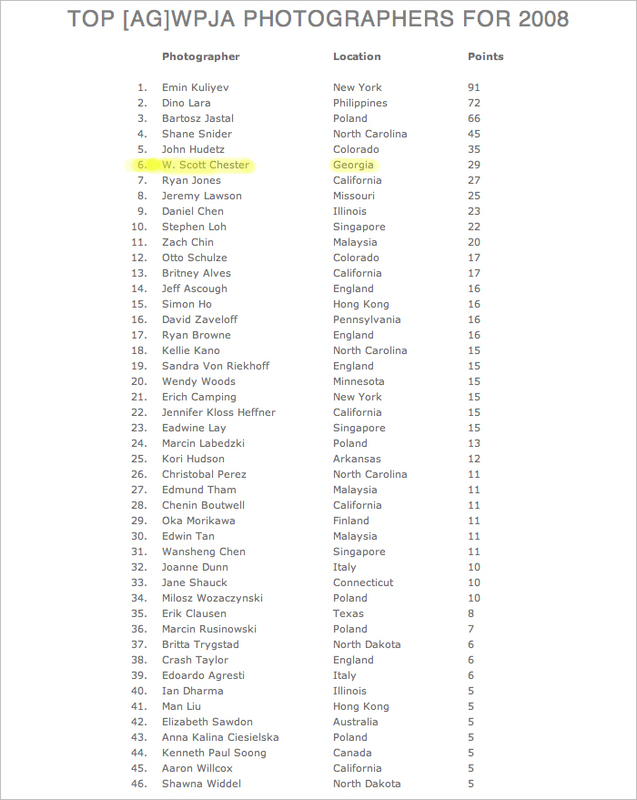 to be one of the top 10 artistic wedding photojournalists worldwide for the entire year is just phenomenal + i'm blown away by scott's accomplishment! a huge congrats to all the top photographers from all over the world + here's to an inspiring 2009! who knew lindsay + tripp's wedding at serenbe was going to be the bee's knees this week on our blog?!? we were so giddy a few months ago when kathryn from snippett & ink asked to feature it as a real wedding post for this week! 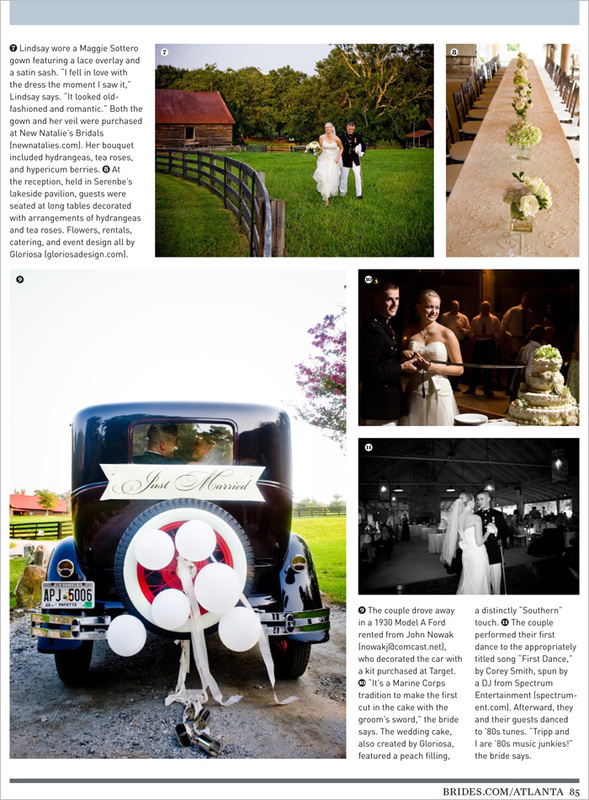 this is the very first military wedding they have featured and this wedding is also filled with lots of southern charm! in case you have been buried under a rock and don't know, snippett & ink is the cat's whiskers [i'm on a roll here with the phrases] in the land of sophisticated + stylish wedding blogs! kathryn has a penchant for designing fabulous inspiration boards each week + if you're planning a wedding or just love to look at pretty things, be sure to add the blog to your reader. PLEASE CLICK HERE TO SEE THE FEATURE!!! 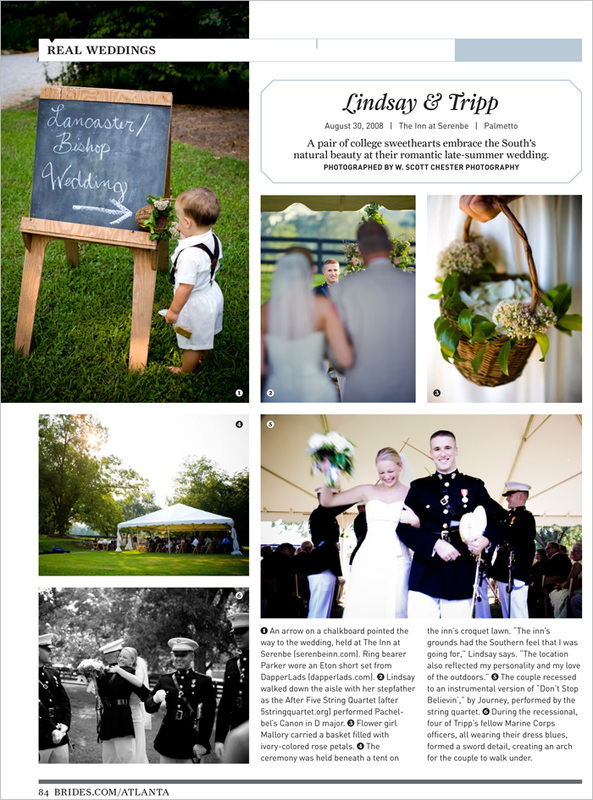 lindsay + tripp's amazing military wedding at serenbe last august has been featured as a real wedding in the spring/summer 09 issue of bride's atlanta! high fives to shannan + the gang at gloriosa for bringing together all the details of this brilliant wedding! lindsay + tripp + sue (lindsay's fabulous mom) were so wonderful to work with and everyone that follows this blog knows how much we love photographing weddings at serenbe! 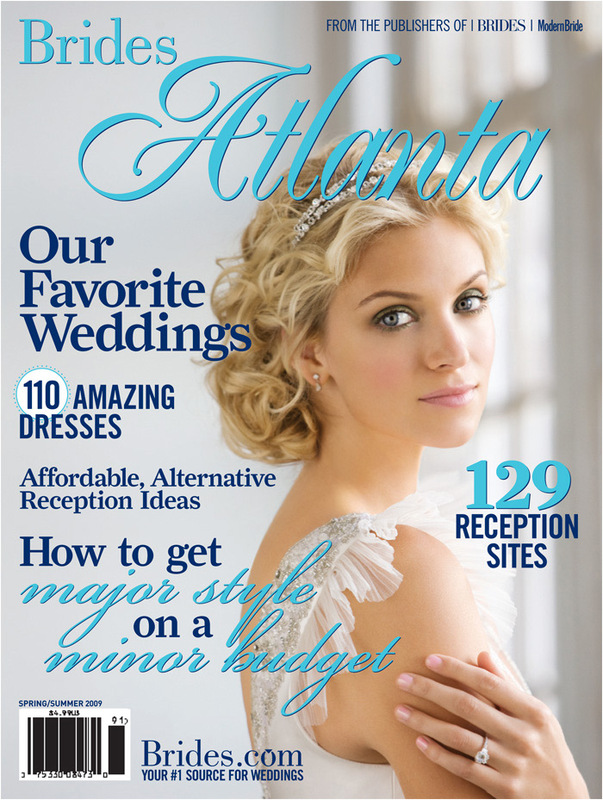 here's the layout highlighting the images the magazine selected for the real weddings feature + also a glimpse of the magazine cover.